LG has announced a competitor to the Philips Hue (http://meethue.com/), a remote-control bulb that can display multiple colours, according to your moods. the bulb will last for a decade if used for five hours per day. In addition, it comes with compatible iOS and Android apps and supports Bluetooth. The apps allow users to control a range of settings, and include a security mode — which uses a lighting sequence to mimic someone being at home — and a play mode that responds to music. Fancy a light-based alarm clock? It can be easily programmed as such. The bulb will even blink as a reminder when you get a call, though this is an Android-only feature at first. 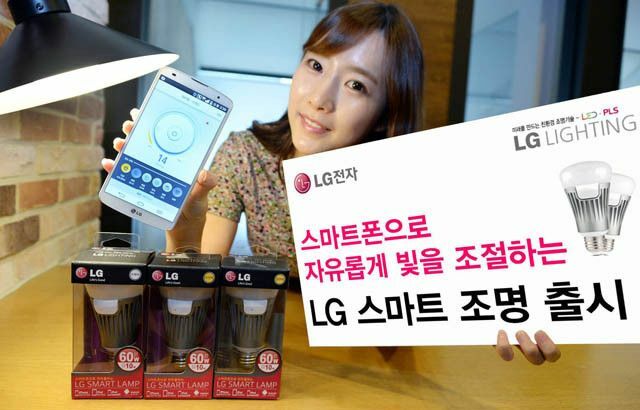 The Smart Lamp is more expensive than ordinary LEDs at 35,000 won (US$32) in LG’s native Korea, but it could be a good deal if you don’t need the many-colored lighting of Hue and similar systems. In comparison, Philips Hue retails for $199.95 in the U.S. Apple Online Store or S$319 in Singapore, and this bags customers a “Starter Pack” containing three bulbs and the Hue bridge. $100 for one light bulb means it is priced out of the range of most consumers. If LG can bring a similar feature set to the table while undercutting Philips on price, it could be we’re able to take a step closer to more affordable iOS-powered home automation. Alternatively, I am also quite keen on an alternative WiFi socket for home automation – the Broadlink SP1. At about US$35, it is not cheap but could offer up a lot more alternative than just controlling a light bulb. It is similar to the Plugaway which was quite successful on Kickstarter. The Broadlink SP1 is a smart socket with Wi-Fi connectivity that you can control remotely with your Android or iOS mobile device through a specific app in order to turn on and off lights, water heater, and other electrical appliances. It is similar to the Belkin Wemo, but about 30-40% cheaper. The only catch, you would need to use a China to G Plug (UK 3 pin adapter) to use it in Singapore. HTC One M8 First Thoughts & Singapore Launch April 2014?